Mixed media clay, A: 22" x 13" x 15"
B: 16" x 23" x 18" C: 17" x 14" x 14" D: 7" x 19" x 1 1 "
Roxanne Swentzell is a young artist whose artistic wisdom is far beyond her years. She brings to Native American sculpture an integrity of technique and understanding of her materials. Swentzell is the niece of Nora NaranjoMorse and is also well grounded in the realm of Santa Clara pottery produced by her grandmother, her mother and her aunts. 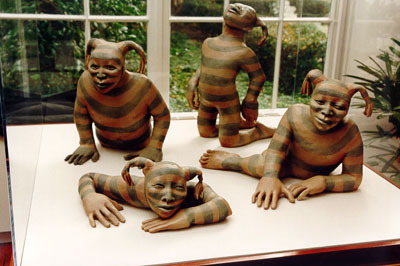 She has developed a style of figurative sculpture that is derived from the figurative effigy forms of her Pueblo ancestors. These ancient forms are abstract and are not meant to be realistic. Swentzell's figures are very realistic. Her knowledge of the human form, more specifically the Pueblo body is evident. Her technique is true to the ancient coil and scrape method of pot building. She takes that method to another level with the use of sculpture's tools to define her human forms. "The Emergence of the Clowns" represents the ascendence of the Pueblo people into this world. The Koshares or Scared Clowns are remembering the migration of the First People. Swentzell's ability to capture human emotion is most evident in this sculpture. She has captured the feelings of wonderment, awe, knowledge and joy in the four figures. Her use of the partial human forms which gradually bring forth the complete body with the final figure represents and further accentuates their journey upward.